I want to join QuickLoad. What do I need to start? DOT and Motor Carriers Authority (MC). Color Copy of Commercial Driver's License for each driver. (Independent owners should send their own Driver's License). A QuickLoad team member will contact you within 24 hours. I’m a dispatcher, how can I use QuickLoad? You can sign up as a carrier, follow the instructions, and provide all the necessary documentation. You will be able to add as many drivers as you want. Once you receive an approval, you will be able to find jobs and assign them to your drivers. I’m an owner operator. How can I use QuickLoad? Sign up on our website, follow the instructions, and provide all the necessary documentation. Once approved, you are ready to go! Is there any contract attached? No. You do not need to sign a contract. You work your own hours and take the jobs that you want. Will I need to use the QuickLoad for all my shipments? You can use us as your primary source of shipments/jobs, for your return trips, or as a secondary source. QuickLoad is free for carriers. Shippers pay a service fee that allows us to keep the platform running properly, facilitates the connection between carriers and shippers in just minutes, and gives you unlimited access to our support team. I accepted a job, now what? Once a job is accepted, the shipper will be notified and details about the shipment will be sent to the dispatcher or owner operator. You will be able to contact the shipper through the app. How much does it cost to use QuickLoad? QuickLoad is free to enroll for both carriers and shippers. And it always will be. There are no monthly or membership fees. Why I should use QuickLoad? Get paid faster directly to your bank account. We'll fee-free pay you right after sending usthe proof of delivery (POD). Be your own boss. No contracts. Work your own hours. We process the payment to the carriers right after after receiving proof of delivery. How to change the driver on the app? Select another driver from your team to complete the job. Learn how to change the driver here. How do I add a driver to my team? Add a new driver to your team on the app. Learn how to do it here. How do I start a job? Learn how to pick a job, accept and start on the app. Click here. Who provides the Bill of Lading (BOL)? Either if you need to pickup or drop off a container from/to Port of Miami or Port Everglades, need to move 4 pallets or boxes, we are your shipment solution. You set your own price or we can suggest you a rate for better chances to get a trusted carrier within minutes. Transparency: No monthly fee. No hidden costs. QuickLoad Service Fee is fixed. It helps us to keep our platform running properly. Never babysit another shipment. You'll always know where your shipments are. A trusted network of trucking companies. We do the paperwork for you so you can focus on your business. Daily tracking: safety rating, insurance, DOT. 24/7 support: Any questions, doubts or concerns, just let us know. Delivery guaranteed: we have a large network of trusted carriers. You can rest assured that if your carrier cancels we’ll find you another one promptly. To see more benefits, visit our “Shipper” section here. QuickLoad charges a service fee of the price of your shipment. It includes all of our great features, and unlimited access to our support team. There are no monthly fees, and you only pay for what you use. There’s no minimum transaction processing amount. The only additional charge you might get is for waiting times or cancellations. And you will always know it as soon as it happens. Waiting time: Detention time beyond 60 minutes at each location will incur in $25 for each additional 30 minutes. How does the cancellation policy of QuickLoad work? Cancellation Policy: If a shipper makes modifications to a booking already accepted by a carrier, the carrier might accept or reject the new terms of the booking. Yes. QuickLoad’s payment system is supported by Braintree, a member of the PayPal family. You can rest assured that we are confidently backed by one of the most established players in the digital commerce space. What services can I add when scheduling a container load? We offer you different options when picking-up/dropping off a container. You can either select pre-pull, extra legs, drop off, overweight or bonded. How can I know how my shipment is going? QuickLoad is here for you! From helping you setup your account, managing your loads to checking the status of your delivery. Our customer service is available from Monday through Sunday, from 7:00 am - 8:00 pm. Can I track shipments not booked on QuickLoad? Unfortunately, we do not have access to track shipments booked outside of QuickLoad. If you’re doing constant shipments (e.g. twice a week) that you would like us to take care of, we’d be happy to assist you. Call us for special pricing and predictable volume: (305) 827-0001. QuickLoad recommend a rate based on the type of the load, mileage and equipment needed. Shippers also are able to set the price and they should consider miles, weight and equipment requested. The shipper will be charged a Quickload Service Fee for guaranteed delivery, extra insurance coverage, and unlimited access to our support team. We will hold the funds in your account right after the carrier takes the job. Once the carrier sends proof of delivery (POD) we’ll proceed to charge the amount agreed upon. Can I select my Carrier? QuickLoad is proud of providing the most efficient move possible – the right truck, on time, at the right price. We are transparent and we make sure that every carrier registered in QuickLoad is able to complete the job with the highest standard of quality. In case shippers have any complaints about a carrier, QuickLoad will promptly respond to the situation. Our accounting department will be happy to answer any billing questions (or any questions, really!) you may have. Email them at support@quickload.com. Why was my shipment canceled? A job is officially canceled when the carrier or shipper calls QuickLoad to cancel the shipment and receives a cancellation confirmation email. The shipper clicks the cancellation button on the cancellation confirmation message, which they can find in the My Shipments section. The shipper calls QuickLoad to cancel the shipment and receives a cancellation confirmation email. If a trucking company cancel a job, it might be penalized or charged in certain circumstances. What’s the cutoff time for the same day pickup? Cutoff time will vary depending on the facility. A warehouse may work only by appointment. This should be notified on the delivery order. How do I use my credit line? Get credit terms (up to 60-days) that work for you, with integrated checkout from your credit line. Learn how to use it here. How I see my invoices? Find the invoice you're looking for on your quickload account, then see details or download it! Learn how to do it here. Pay your pending invoices using your credit card or ACH through quickload. Learn how to do it here. How to find my Routing Number? Your routing number identifies the location where your account was opened. You'll often be asked for your checking account routing number when you're making a payment online or by phone. Learn how to find it here. How do carriers get paid? Carriers will get paid via direct deposit in the bank account provided when signing up. Login and create your profile as a carrier if you haul with us, or as a shipper if you ship with us. Sign up and create your profile (Just the first time). Select our suggested rate for better chances to get matched faster. Add your payment method and submit your shipment. The load will be broadcasted to all carriers in our network . As soon as a driver accept the job, we'll let you know. Once you are approved you start receiving loads available. Something worth taking? Accept the job right from your phone. Do the job and send us proof of delivery. Get paid fee-free within 48 hours. 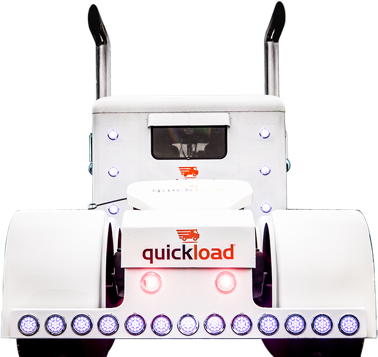 QuickLoad is a Smart Trucking Network that makes shipping freight quicker, safer and more competitive. We are a platform committed to reduce the empty miles that truck drivers are forced to drive while looking for their next shipment. That allows shippers connect with more carriers at better rates. We are not a load board. We provide a complete solution that includes connecting shippers and carriers, we let them set the price, and we track shipments. We are not a traditional broker. We take pride in our transparency policy. Learn more about it below. Carriers: Any truck company that are able to do LTL, FTL or container. From dispatchers to owners operators. Shippers, brokers, and freight forwarders: Any company around the world in need of moving freight within the State of Florida. Currently we are focusing on LTL, FTL and containers of commercial cargo. What does QuickLoad do with my information? Once you sign up, QuickLoad keeps your information safe. We do not share it with anyone else. Where in the world is QuickLoad available? QuickLoad is currently available in Florida. If you have special freight service out of the state, we'd be happy to help. Call us at (305) 827-0001. What kinds of shipments can I book or find with QuickLoad? You can book or find any type of product as long as it comes in pallets, boxes or bundle. We can help you as well with your glass and marble slabs. We offer Container, LTL, FTL flatbed deliveries, as well as Dry Van deliveries. How long will it take to get a QuickLoad account? Shippers can start using QuickLoad immediately after completing our signup form. In the case of carriers, we’ll need to gather some additional information before you can start accepting jobs. Once we receive that information, you will be ready to accept your first job after one (1) business day. From Monday to Sunday. Calls and live chat: 7am - 8pm. Email and SMS: 24 hours / day. How can I update or change the driver on the app? Step 1: Go to 'job actions' and click on 'change driver'. Step 2: Select one driver. "Step 1: Click on 'Drivers' and go to 'Add New Driver'. Step 2: Send an invitation to the driver. Reach out to us at hello@quickload.com or calling at (786) 636-8269. Contact our support team at ​support@quickload.com they will get back shortly.